Cheese is an excellent source of protein. 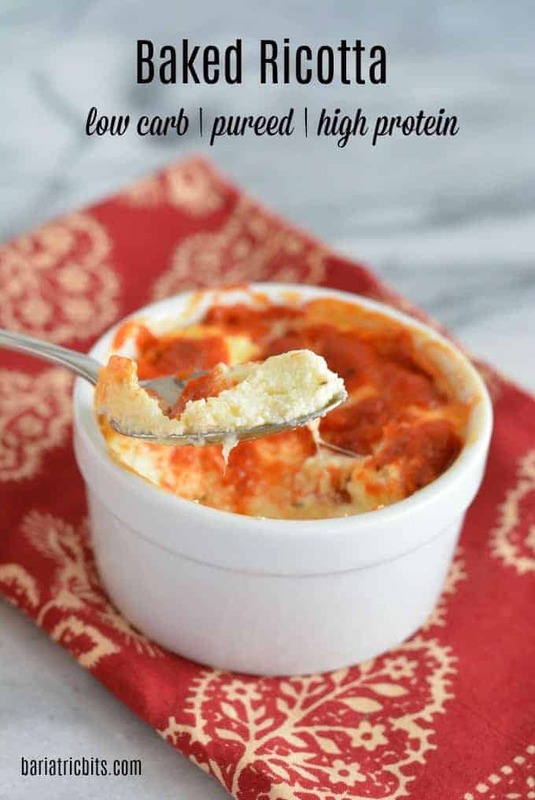 Single Serve Baked Ricotta is the perfect consistency and protein source for a patient after weight loss surgery. I heard a surgeon once give a patient a hard time because she was eating ricotta cheese. Patients often assume they can’t eat any cheese after surgery. I guess this surgeon did too! I disagree. Yes, cheese does contain various amounts of fat and therefore calories, but cheese is a great source of protein. Better yet cheese is soft and often tolerated after bariatric surgery. 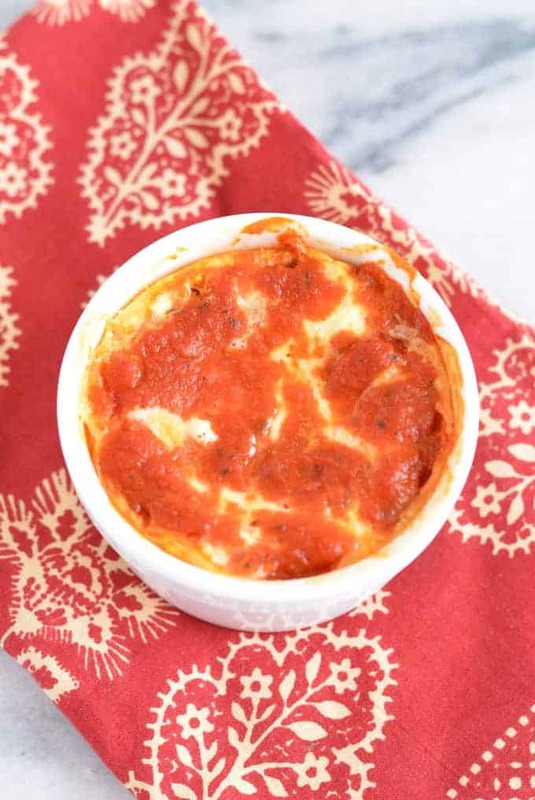 This baked ricotta recipe is under 150 calories. I don’t think that bad at all! Use ramekins and a measuring cup to portion out the ricotta cheese. Grease the ramekins with olive oil spray, not regular olive oil. You use less oil with the spray, which equals fewer calories. Use part-skim ricotta not whole milk to reduce fat and calories. 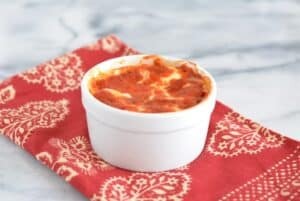 Top the baked ricotta with a smooth marinara sauce not chunky if you are on the pureed stage. Many recipes call for extra cheese and olive oil on the top. I eliminated this to decrease fat and total calories. The marinara sauce in a lower fat/calorie choice. Baked ricotta is a good source of protein and the perfect texture to eat during the pureed stage after weight loss surgery. Spray 5 ramekins with olive oil and place on a baking sheet. In a medium bowl combine ricotta cheese, parmesan cheese, basil, garlic powder, salt, and pepper. Stir ricotta mixture to fully combine. Place 1/4-1/3 cup of the ricotta mixture into the prepared ramekins. Top with 1 tablespoon of smooth marinara sauce. Other recipes you may enjoy that are rich in protein, but low carb. Husband and I have had the sleeve, Working on new 2 serving dishes .Your site follows our goals. So glad you are finding helpful information. Just wondering if adding eggs would add extra protein after barriatric surgery? Also can this dish be frozen in portion size containers? You can add eggs for additional protein. The texture will change as eggs will likely make the ricotta stiffer and thicker. You can freeze the dish in the portion size containers. Can this be frozen? Also how long do these keep in fridge? You can keep the recipe in the fridge for no longer than a week. As far as freezing I haven’t tried it. Freezing ricotta may change the texture because of the moisture content. If you do freeze the recipe make sure you use an airtight container or wrap the cups well. I would only keep in the freezer for a month. Do i need grated or shredded parmesan cheese? I also add a scoop of unflavored protein powder to the ricotta. Has anyone tried this with buffalo sauce instead of marinara? I also added chicken- yum! I have not, but sounds yummy! Totally delicious! Guilt free good for me food!